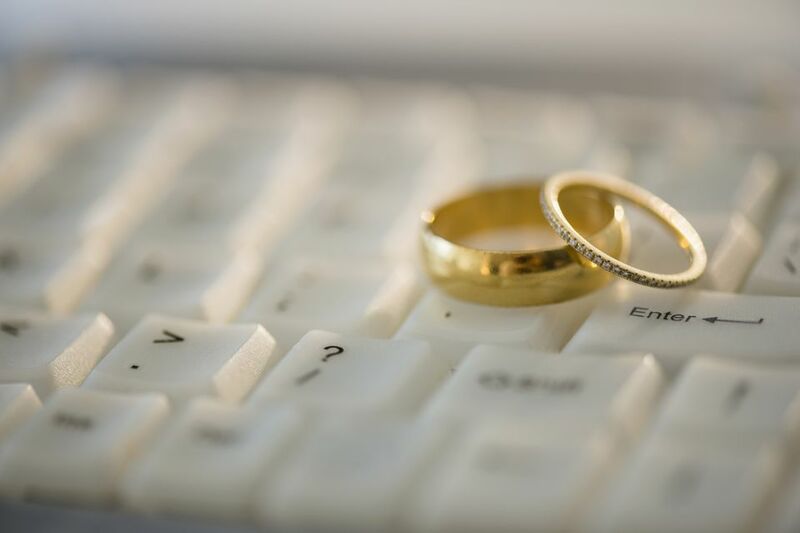 Create a free wedding website for your upcoming nuptials so your friends and family will be able to keep closely connected to your wedding details as the special day nears. These free wedding websites will allow you to create pages that include details about the ceremony, information about the reception, links to your wedding registries, maps and area information, photos, facts about you and your wedding party, an online guest book, and a place where your guests can RSVP. Some of these free wedding websites even come with a personalized domain name and a mobile website. It's easy to set up a free wedding website with built-in tools to help you add your information and get the website looking great with your chosen colors and photos. Besides being easy, it's quick and you'll have your wedding website up and running in 5-10 minutes. 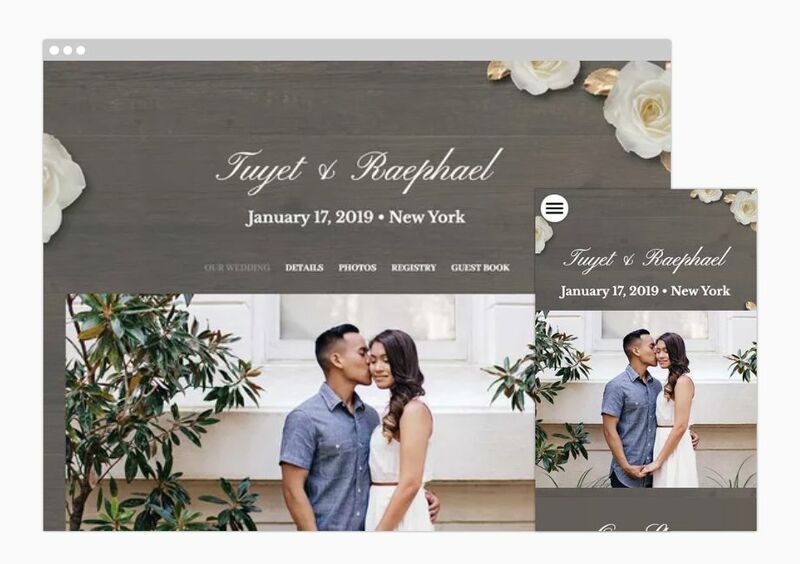 You can share your wedding website address on your save the date cards, wedding invitations, engagement party invitations, or simply by sharing it through email. Tip: All of the websites listed below offer free wedding websites but some offer websites that you can pay for as well. When you sign up just make sure that you select the free option. After you've picked out your free wedding website, here's some advice on what details you should include on your wedding website to help you get everything set up and ready for your guests to view. There are many other wedding freebies to help you save on your budget including wedding templates, registry gifts, and more. The Knot has over 100 free wedding websites in classic, modern, rustic and beach designs that are available in a variety of color schemes. These designs look great and you can make your website as simple or as detailed as you would like. When your friends and family first visit the free wedding website you created at The Knot, they'll see a welcome page that includes a photo and countdown to the wedding. You can choose to include pages about your proposal, love story, wedding party, honeymoon and even add a photo album and guest book. ﻿There is plenty of room for details about your ceremony and reception as well as links to maps, registries, hotel accommodations, and there is even a place where your guests can RSVP. As an added bonus, the free wedding websites at The Knot and are mobile-friendly for those on the go. Zola has over 140 free wedding website templates in a variety of styles that you can sort through by color. You can view the details as well as a demo of each theme before you make the tough choice of choosing one. All the website templates can be customized with wedding details, photos, Zola's registry, travel information, and any other details you'd like to share with your guests. Guests can also RSVP online through your website. You can change your theme at any time without losing your information. WeddingWire is another great place to go to for a free wedding website. They have over 120 designer website themes that are inspired by popular wedding icons like Vera Wang and Martha Stewart. They also have their own series of unique themes that you won't find anywhere else. You can search the templates by color and style. While your guests browse around the pages of your WeddingWire website, they'll be able to visit pages that give them details about your wedding as well as pages you can create that tell your story. You can even add music to each page of the website to help create a one of a kind experience for your family and friends. You'll get a free customized website address, unlimited pages, and 100 MB of storage for your free wedding website. Extra options you can include to your free wedding website include a wedding countdown, visitor count, and a flash intro. eWedding has a dozen gorgeous themes from the casual to the fabulous for you to use on the free wedding website that you create there. If that wasn't enough, for each theme there's a ton of color options so you can get a website that reflects your wedding colors. Once you've decided on a theme, you can enter all your wedding details including your love story, wedding party, registry details, engagement photos, wedding events, travel and accommodations, the timeline to your wedding, and fun polls and quizzes. Guests can also post to your website and RSVP to the wedding from there. Joy has a great selection of free wedding website themes that fit well with a classic, modern, rustic, beach or any other type of wedding vibe you're going after. Joy's wedding websites have lots of bells and whistles including a global guest list, the ability to password protect your website, and giving you many ways to share your wedding details including your wedding party and travel details. You'll be able to share your customized website with your guests where they can RSVP, meet other guests virtually, and upload photos.